Flamenco beats and Spanish flair will energize the North Shore Center for the Performing Arts in Skokie this weekend as the 34th annual International American Spanish Dance Festival culminates in three performances of Flamenco Passion. A much-anticipated event each year, Northeastern Illinois University's Chicago's Ensemble Español Center for Spanish Dance and Music has once again brought together a sampling of the best in Spanish art, music, and dance for a celebration of "Spain in America." To close out a week of art exhibits, music performances, and master classes, Flamenco Passion will feature three world premieres, showcasing a wide range of flamenco styles. 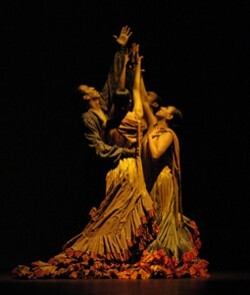 Flamenco Passion performances will take place at the North Shore Center for the Performing Arts in Skokie, 9501 Skokie Blvd. Friday, June 25 and Saturday June 26 at 7:30 pm and Sunday, June 27 at 3 pm Tickets are $26-$46. Free parking is available. For tickets or more information call 847-673-6300 or visit northshorecenter.org.